Abstract : Convolutional Neural Networks (ConvNets) have become the state-of-the-art for many classification and regression problems in computer vision. When it comes to regression, approaches such as measuring the Euclidean distance of target and predictions are often employed as output layer. 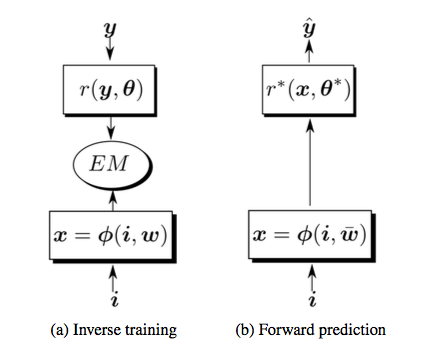 In this paper, we propose the coupling of a Gaussian mixture of linear inverse regressions with a ConvNet, and we describe the methodological foundations and the associated algorithm to jointly train the deep network and the regression function. We test our model on the head-pose estimation problem. In this particular problem, we show that inverse regression outperforms regression models currently used by state-of-the-art computer vision methods. Our method does not require the incorporation of additional data, as it is often proposed in the literature, thus it is able to work well on relatively small training datasets. Finally, it outperforms state-of-the-art methods in head-pose estimation using a widely used head-pose dataset. To the best of our knowledge, we are the first to incorporate inverse regression into deep learning for computer vision applications .